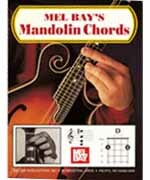 Comprehensive and easily understood, this Mel Bay stand-by is arranged in photo-diagram form for maximum ease of use by mandolinists of all playing levels. Correct left hand positions are pictured for each chord, as is proper right hand picking position. Major, Minor, seventh, diminished, augmented, and ninth chords are shown in photos and diagrams; major seventh, sixth, minor sixth, seventh augmented fifth, and seventh diminished fifth chords are shown in diagram form only. Tuning of the mandolin using a pitch pipe or piano keyboard is also shown. A chart summarizing movable chord patterns ends the book.